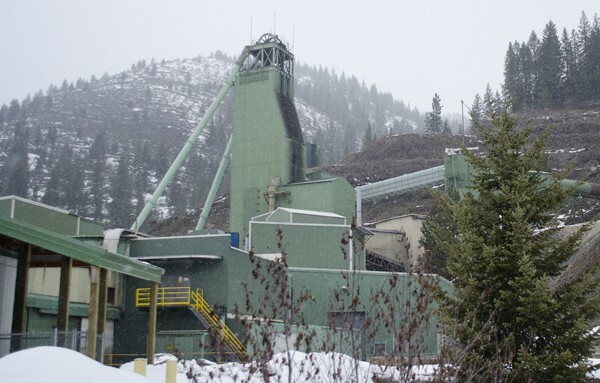 The Coeur d'Alene-based Hecla Mining Company announced today that national mining inspectors have declined to issue the Lucky Friday Mine a violation notice on safety concerns. The Lucky Friday mine in Mullan, Idaho, closed in early 2012 after two deadly incidents and a rock burst that injured several workers. The Mine Safety and Health Administration last year indicated it might issue Hecla a "potential pattern of violations" notice over ongoing safety issues. Hecla President and CEO Phillips Baker Jr. says the company has cooperated closely with MSHA officials to address their safety concerns. The company announced the MSHA decision this morning. "We are pleased that following the rehabilitation of the shaft, training and other work, MSHA has decided that the PPOV is not required," Baker says in a statement. "We have worked with MSHA, and are continuing to enhance many aspects of the mine’s operations and safety…"
After about a yearlong closure, Hecla restarted mining operations at the Lucky Friday in mid-February. Baker announced the mine would ramp up production levels throughout the year. The company also rehired about 90 percent of the mine's previous workforce. "The Company has recalled the employees necessary to reach full production," the company announcement states, "and arranged for all employees, both returning and new, to receive supplemental safety training, with enhanced procedures for risk assessment and accident prevention designed to improve existing safe work practices."